The decline in the availability of cereals and oilseeds has led to the study of different ingredients in animal feeding that do not affect meat quality. Chicory (Cichorium intybus) vinasse is a by-product of chicory processing, which could be used as a source of protein in animal diets. The aim of this study was to evaluate carcass yield and meat quality parameters of broiler chickens fed with chicory vinasse as a replacement for soybean meal during the fattening stage. A total of 320 broiler chickens and 5 treatments replacing soybean meal for chicory vinasse were used: 0 (T0), 25 (T1), 50 (T2), 75 (T3) and 100% (T4). Carcass yield, pH, drip loss, color, composition and sensorial acceptance of meat were determined. Carcass yield ranged from 54.27 to 71.46%, with a higher yield in T0 and T1 (P ≤ 0.05). The pH value was 5.79-6.23; drip loss was 1.19-3.05%; color difference (ΔE) ranged from 0.70 to 3.94; and the sensorial acceptance was high for the treatments including vinasse (P > 0.05). No significant differences (P > 0.05) were observed in breast composition. However, there were significant differences (P ≤ 0.05) in lightness (L*) and composition of the thigh in T4 compared with T0. Therefore, the replacement of soybean meal for chicory vinasse in the diet of broiler chickens during fattening above 25% causes a decrease in carcass yield, while a 100% chicory vinasse replacement affects the lightness and chemical composition of the thigh. Key words: breast, thigh, soybean meal, carcass yield, color, acceptance. 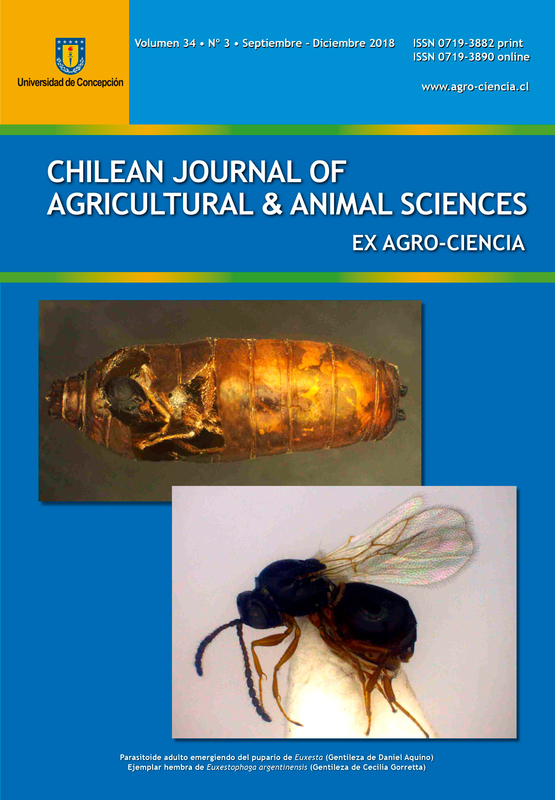 1 Department of Animal Sciences, Faculty of Agronomy, University of Concepción, P.O. Box 537, Chillán, Chile.